Welcome to The Doryman Pub & Grill. Come in. Sit down. Relax. But most importantly… just have a good time! 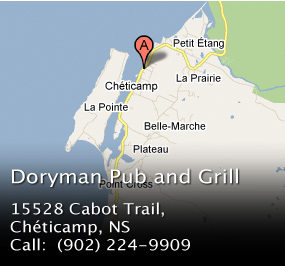 Located in the picturesque seaside Acadian village of Cheticamp on the Cabot Trail, The Doryman’s reputation for live music is a perfect example of how this community is “toujours chantante”. Good Times at the Doryman! Every Friday is Wing Night starting at 4:30pm! Come enjoy our weekly Entertainment! !